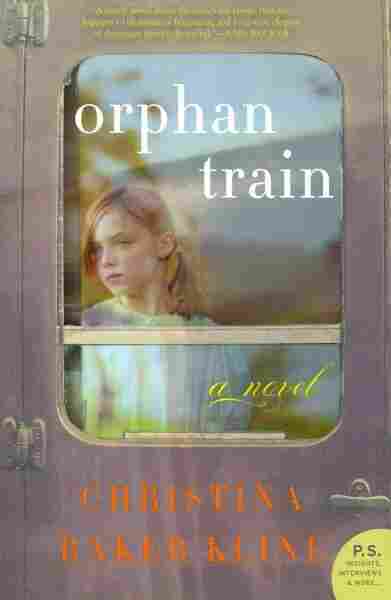 After Tragedy, Young Girl Shipped West On 'Orphan Train' Christina Baker Kline's new novel incorporates a true piece of American history. One of the book's protagonists, an Irish orphan, is packed onto a train and sent to the Midwest. In real life, "orphan trains" were intended to save children from the streets, but sometimes resulted in near-slavery. Christina Baker Kline's new novel, Orphan Train, is partially set in 1929, mere months before the stock market crash that would trigger the Great Depression. A young Irish girl, Niamh (pronounced "Neeve"), has just lost her entire family after a fire ripped through their tenement building. She is turned over to authorities who put her on a train bound for the Midwest. The train is filled with dozens of other children who have lost their families in one way or another; they are now hoping that their journey will connect them with new parents and a new, better life. Kline's book is fictional, but it's based on the very true history of thousands of children shipped to the Midwest. Kline joins NPR's Rachel Martin to discuss the history of the trains, how young girls were often passed over by families and the most surprising fact she learned from train riders. On the true story of America's "orphan trains"
"I was stunned to discover this part of American history that I never knew anything about and that I had never learned in a history book. I started to do research and I discovered that over 200,000 children had been sent on these trains between 1854 and 1929. "There was a Methodist minister in New York City named Charles Loring Brace. He was a compassionate person and at the time there were no social programs for children in terms of social welfare programs, foster care, child labor laws, and so at the time, between 10- and 30,000 children were living on the street. And at the time also the railroads were expanding westward. And it was these confluence of events, the railroads allowed Charles Loring Brace to establish his vision of sending vagrant kids from the streets of New York to the Midwest to start working the land. "It was [to try to find them new families], yes, but it was also to populate the Midwest and to provide labor. So it's very complicated, all the motivations for the orphan trains. And as I looked back and, talking to train riders who are still alive, there are a lot of mixed feelings about the whole enterprise. At its worst it was not much better than slavery. They were all between the ages of mostly 2 — but sometimes as young as babies, baby trains were called 'mercy trains' — and up to the age of 14. Those 14-year-old boys, 12- to 14-year-old boys, were the most in demand because obviously they were labor." "First of all, she has a name that's hard to spell — it's Niamh, which is an Irish name — and second she has red hair. I came across a newspaper article from The New York Times about how the trains that were being sent were not allowing redheads. It was just noted that they weren't wanted. But yes, so, my character is Catholic and she's taken in by several different kinds of families, but ends up with a Methodist family who want her to go to church with them. "Adolescent girls were the last chosen of the train riders because they were seen sometimes as a threat to the woman of the household, and they also were considered incorrigible. The boys could live in the barn and it didn't really matter — and lots of boys describe living in barns or sheds. The girls would have to live in the household, but they often had accents that were hard to understand, or they didn't speak very good English. They looked quite different, perhaps. And so I wanted to convey the kind of rejection that girls had to go through in different ways. For example, my character goes into a household and the mother is always suspicious of her and ends up throwing her out because the father is just an alcoholic and, of course, it turns out, lecherous in some way, too, which is again, not an uncommon story, as you can imagine from situations like these." "The most surprising historical thing, I believe, is that time and again the train riders would tell me — and eventually as I read more and more I realized that this was very common — they believed they were the only ones. So a trainload of children would leave New York, and they didn't know that other trains were also leaving, and that eventually there were 200,000 children who were sent — so they felt quite isolated. They were separated from siblings, they weren't allowed to bring anything with them at all, their birth records were kept secret, so eventually in the 1960s and '70s, when finally train riders and their descendants started to make reunions, if possible, it was only then that train riders discovered that there were others." "Part of the reason I wanted to write a novel was that in fiction I could do something that's difficult to do in real life, which is to dwell on the stark details of the experience without really needing to create that narrative of redemption. I wanted to show a strong character who would survive, but I also wanted to show how hard it was."